The Zero Theorem is Terry Gilliam's latest science fiction black comedy, and it provides an excellent test for identifying fans of the director. While by no means a bad movie, it's also far from Gilliam's best work; but it does exhibit his distinct sense of style, and anyone who loves Brazil or 12 Monkeys will find themselves right at home. It's satirical, it's surreal, and most of all it's just plain weird. It has Tilda Swinton rapping. So let's get under the hood and take a look at why this creation never quite comes to life. The biggest problem with The Zero Theorem is that it feels like generic science fiction as made by a very creative director which fails precisely because of the difficulties inherent to its own creativity. It's a movie which never compromises its vision in order to appeal to a general audience, but in throwing out the playbook on how to write a story it encounters more difficulties than can be easily overcome. Its dedication to telling the story it wants to tell is admirable, but—while it left me with generally positive feelings—it could have been so much more. Qohen ("q-no-u-o-h-e-n"; Christoph Waltz) works hard at his thankless, monotonous job in the hopes that one day he will receive a phone call which will tell him what his purpose in life is. After complaining repeatedly to his boss, this man waiting to be given meaning is instead given the task of proving that everything is ultimately meaningless. 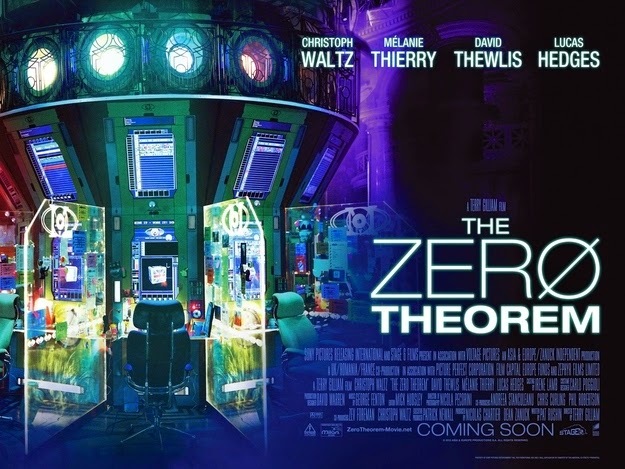 The "zero theorem" is an attempt to take all the matter in the universe and make it equal zero; Qohen's new job is to make sure "everything adds up to nothing," that "zero equals one-hundred percent". While he initially shows dedication to the new assignment, he eventually becomes frustrated with its pointlessness, and Management (Matt Damon) must send in his talented but delinquent son Bob (Lucas Hedges) to fix the situation. As far as creating a movie about the search for meaning in a progressively meaningless universe, I really can't fault Terry Gilliam for his ambition. He creates a rich and vibrant world for his characters to inhabit, and then pursues the questions he's interested in without relying on fights or chases to keep the audience awake. The fact that he doesn't provide many answers to those questions will probably divide audiences slightly, but personally I don't mind this ambiguity. I like films which explore big questions but force you to find your own answers. I just don't think this does as much as it could with what it has. The call around which Qohen's life is organized is an intriguing and poignant element in the film's narrative, but it's dismissed as meaningless in a single line at the end of the film. Regardless of what position the film took on it, I was hoping for at least some recognition of the fact that this fantasy of future fulfillment does actually provide some level of subjective purpose. In a world without objective meaning we're forced to create it for ourselves, and in this sense there's some truth to Qohen's expectations. Whether the call we're waiting for gives us our purpose or not, it's the expectation of it which keeps us moving forward. Life is about the journey, not the destination. Where The Zero Theorem really succeeds though is in its visuals and performances. The world Gilliam creates is intriguing, and I left wanting to see more of it and know more about it. It takes its influences from various sources (1984 for one), but puts them together in unique and personal ways (it looks like nothing more than Gilliam's own Brazil). Christoph Waltz does an excellent job in his leading role, evoking a neurotic and troubled but not entirely hopeless man. David Thewlis is his typically wonderful self, calling on Michael Palin's character from Brazil but giving it his own individual twist, and Lucas Hedges (Moonrise Kingdom) shows incredible promise as the comic young boy who embraces the paradoxes Qohen can't. I really wanted to love The Zero Theorem and put it up next to Gilliam's other great works, but ultimately it was just a pleasantly average experience. It deserves credit for not simply retreading tired ground, but in blazing a new path it trips over a few too many branches to really excel. "Actually, we own the building. We bought it from an insurance company some years ago. There'd been extensive fire damage. The previous occupants were an order of monastic monks who'd sworn vows of chastity, poverty and silence. Apparently, no one broke the silence to yell fire."